Christmas – it’s a time for carols, drinks and presents. It’s also a time for over-indulging in food, meaning it’s also a time to be careful – especially when it comes to your dog. At Christmas, the vast majority of houses are filled with a variety of goodies, which if eaten in large quantities can cause problems. But of all of these festive treats – the turkey, the potatoes, the cranberry sauce and the cheese – for dogs, chocolate is the one to be most careful of. That’s because unlike humans, chocolate is toxic to dogs. Chocolate comes from the Theobroma cacao plant, a name which translates from Greek to ‘food of the Gods’ (theos – ‘God’; broma – ‘food’). I’m sure you’ll agree the name is justified. But if you’ve ever eaten an entire box of chocolates at once, you’ll know that eating too much of this ‘Godly’ food can leave you with an upset tummy or a headache. For dogs, it can be far worse. That’s because one of the main chemicals in chocolate – theobromine – is poisonous to dogs. Theobromine is a member of the alkaloid family, a group of naturally occurring chemical compounds found in plants. Other members of the group include morphine, caffeine and nicotine. Considering how big the chocolate industry is and how much chocolate people eat, it’s won’t be surprising to learn that humans have evolved to be able to break down (metabolise) theobromine. And to do so quite quickly. This means that by in large, chocolate isn’t toxic or dangerous to humans. And that it would take an extremely large quantity of chocolate to do us any damage. But this isn’t the case for dogs. They break down chocolate – and therefore theobromine – far more slowly than people, and indeed many other domestic animals. This means theobromine – and chocolate – is toxic to dogs. Small amounts of chocolate are dangerous. Large amounts can be fatal. Different types of chocolate also pose different risks. This is because the amount of theobromine varies depending on the type of chocolate. White chocolate contains low amounts of this toxic chemical, but it can still be bad for your dog because of the high levels of fat and sugar it contains. 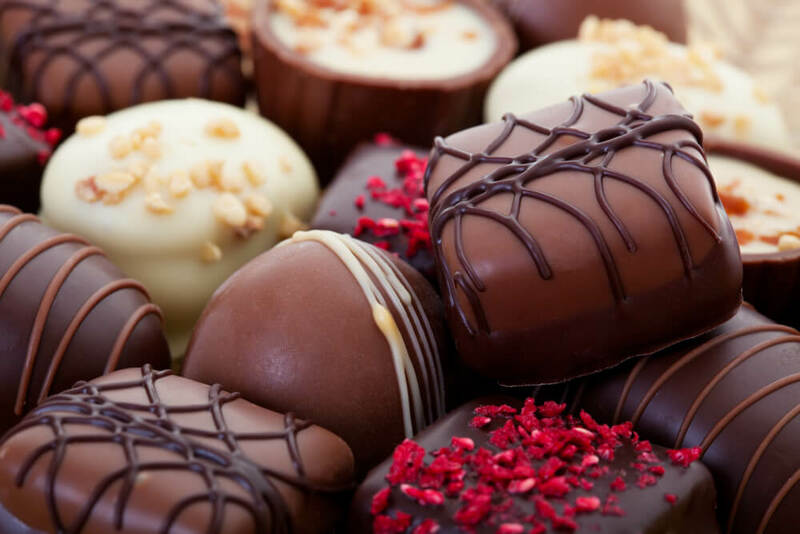 Milk chocolate contains moderate levels of theobromine, while dark chocolate and cooking chocolate contain very high levels and so pose the biggest danger. As is often the case, too much of a good thing can be bad for you. It’s no different with dogs and chocolate. The more chocolate they consume, the worse their symptoms become. This means the clinical signs of theobromine poisoning vary depending on the amount of chocolate your dog has eaten. If you notice your dog displaying any of these symptoms, and if you suspect they’ve eaten chocolate in some form or another, it’s important to seek help and bring them to the vet immediately. Treatment for theobromine poisoning depends on the amount of chocolate a dog has eaten and the symptoms they are displaying. In the majority of cases, the vet will begin by attempting to completely remove the chocolate from your dog’s system. This is usually done by giving medications that induce vomiting and by administering activated charcoal to prevent further absorption of theobromine in the gut. It is also common for dogs to be given fluids via a drip to dilute any traces of theobromine that remain and to encourage its excretion in the urine. Dogs displaying cardiac problems will also be given medication such as beta-blockers to treat and control these symptoms. The sooner dogs who have ingested chocolate are treated, the better their outlook. This is particularly important in the case of older dogs, for whom ‘chocolate poisoning’ is even more dangerous. While it’s always important to make sure your dog doesn’t eat chocolate, it’s important to be particularly vigilant this time of year. That’s because chocolate tends to be more abundant and in greater supply during this festive period. So when you’re tucking into your bars, boxes and tins of chocolates this Christmas, make sure you keep them well and try out of the way of your dog – or indeed any other household pets. The last thing anyone wants is to pay a trip to the vet’s surgery on Christmas day.